One of the dishes that represents Thai food in one bite is Miang Kham. It's a flavor and texture explosion in your mouth! If you have never had it, I suggest you go to Thai restaurants to experience it. Lo lot leaf wraps around roasted coconut, peanuts, ginger, lime, dried shrimp, shallots,Thai bird chili pepper, topped with caramelized sweet sauce. As you chew, you will experience different flavors as well as texture. It won't be as good as mine (sorry!). But you get the idea. Miang means small. Kham means bite. So Miang Kham is small bite. Thais also fashion other food into Miang, one complete small bite with all flavors and textures, normally wrapped in some kinds of greens, lo lot leaves, young Chinese broccoli leaves, or lettuce leaves. But Miang Kham is the original miang and by far the most popular. I remember fondly when Bangkok still had fresh air and blue sky. Thais liked to go to public parks. Two of the most famous ones were Lumpini Park and Sanam Luang. I haven't been there in decades as it's not my favorite thing to bask in hot air and breathe in toxic fumes since I normally go to Thailand during summer months when the weather is hot and muggy and is typically 90+F. What is better than sitting on a mat in the breezy cool evening air, chomping on trays of Miang Kham, chatting with your friends and family, watching kids learn how to ride bicycles or flying kites? Miang kham is the dish that people tend to buy and do not make it themselves because it is labor intensive and time consuming. Until you can not find the one that can satisfy your soul. Then you have to take the matter into your own hands. That's is the case with my mother. So many years after that evening at Lumpini Park, I took my kids to a mall close by my family's home where there was a roof-top water park! We frequented this park especially when the kids were young. This place fit our needs. My husband and my kids loved to swim and I loved to lounge around, reading Thai magazines, and snacking away whatever delightful eats I could procure. Life is good. One year my mother accompanied us to the park. One of the snacks I bought was Miang Kham from the mall's supermarket. I was so excited since it had been a long time that I had Miang Kham. Admittedly, it was not very good, the sauce was weak and lacked complexity. My mom declared that she would make it for me. Like mother like daughter, I got to eat her version soon after that mediocre supermarket's Miang Kham. As I said before, making Miang Kham WELL is labor intensive. My mother will buy a whole mature coconut, crack it open and pry the meat off the coconut shell. She then hand cuts the coconut into thin long strips and then cuts it again crosswise to produce tiny even matched sticks, then roasts them in the oven until light golden brown. Coconut has very high oil content so one has to watch over the roasting with hawk-eyes. It's important that the coconut is cut into the same size otherwise it will be impossible to get evenly roasted. The sauce is another story. It should be thick and flavored with ground coconuts, shallots, ginger, dried shrimps, shrimp paste, tamarind juice, just to name a few. If the sauce is not made well, it will separate with floated gunk on top, not esthetically pleasing. In restaurants in the US, desiccated coconut is used and the sauce is a mixture of fish sauce, palm sugar, and tamarind juice. It has been about 20 years now since my encounter with the supermarket's Miang Kham and that's how long my mother has been making it for me to take home to Seattle every year. :). My friends who have sampled my secret stash now are no longer happy with the restaurant version. One of these days, I have to learn how to make the Miang Kham sauce from my mom and I just have to be contented with desiccated coconut, because I can't do the tedious slicing and shaving that she does! 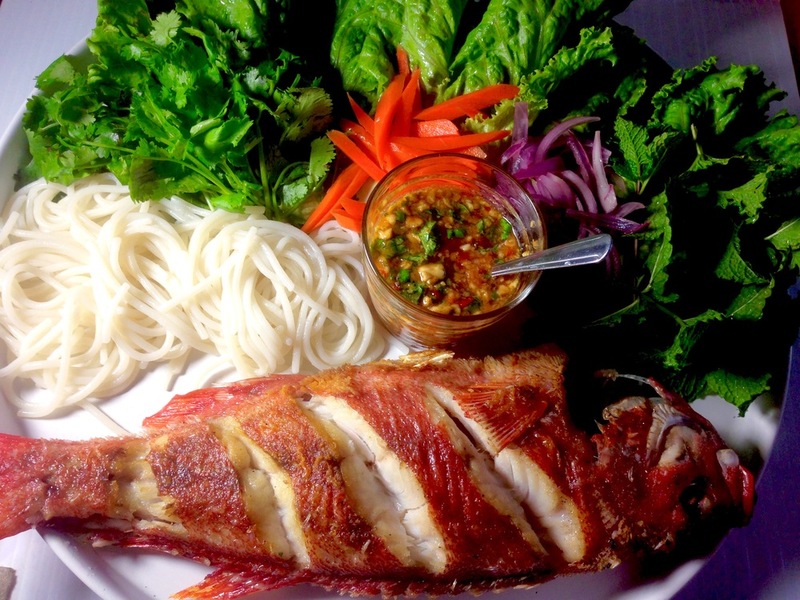 In the meantime, I will give you a recipe for fried fish miang or miang pla tod. It can be an appetizer or dinner. I love it and you will too. The sauce is the key. Pound four Thai red bird chili peppers with 1 clove of garlic until well mashed, add 1 1/2 tablespoons of palm sugar (can be substituted with maple syrup), 1 tablespoon fish sauce, 1 1/2 tablespoons of lime juice. Mix to combine well. Add about 1 tablespoon water to thin the sauce out a little bit. Finally, put in 2 tablespoons chopped roasted peanuts, and 1 tablespoon chopped cilantro. This sauce is divine!! Serve the sauce with fried fish. You can use a whole fish or a fillet, it's up to you. Go to a fish monger and ask for the freshest fish of the day. My dinner is a 1 1/2 lb beautiful red snapper. The fish needs to be descaled, and cleaned. Your fishmonger will be happy to do that for you. I pat the fish dry and make three slashes on each side to make the fish cook faster. Then I rub it with 1/2 tsp. of salt. You food has to be seasoned every step of the way for a harmonious delicious bite. On medium high heat, I pan fry the fish until well browned on one side before flipping it to cook the other side. A good trick to know whether the fish is cooked through is to poke the thickest part of fish with a toothpick. If it comes out easily, the fish is fully cooked. To accompany the fish, you need some cooked rice noodle (follow instruction on the back of the package), green leaf lettuce, green onion, cilantro, and mint. Pickled carrots and red onions will elevate this bite to the top. To make pickled vegetables, bring 1 cup of cider vinegar, 1 tablespoon kosher salt, 1 teaspoon sugar with 1 cup of water to a boil. Pour the vinegar mixture over julienne carrots and thinly sliced red onions. Leave in the fridge about a week to marinate. It will last in the fridge for 3 months. So it's nice to have it on hand when you want to add acidic crunch to your dishes! You will love this dish. So will whoever you serve this too. Happy eating!!. Beautiful red snapper ready to be fried.